Background: Darwin argued that sexual selection (i.e. the competition between males for females, and the females choosing from among competing males) was as important as natural selection (e.g. predators catching the slowest prey) in driving the evolution of traits. Calopteryx splendens, the banded demoiselle, is a fascinating case of this sexual selection. Males have pigmented bands on their wings which they use to signal to females. Females have been shown to prefer males with bigger bands. Further research demonstrated that the substance that produces these spots is the same substance, melanin, that drives the invertebrate immune response. The male damselflies are, therefore, advertising the strength of their immune system to females in an “honest” display. What we did: I was interested in the extent to which the wingspot size varied with latitude, since melanin production is strongly tied to temperature. I had samples of C. splendens from two sites, one in Bedfordshire and another in Northumbria (near to the furthest north site where the banded demoiselle is found). These two populations showed marked differences in the size of the area of pigment with far more pigment in the south, as would be expected if temperature was a limiting factor. You can see this variation in the picture on the right, which shows a Bedfordshire demoiselle on top and a Northumberland demoiselle on the bottom. The species actually changes from having a discrete band to many animals having only a “spot” in the northern population. 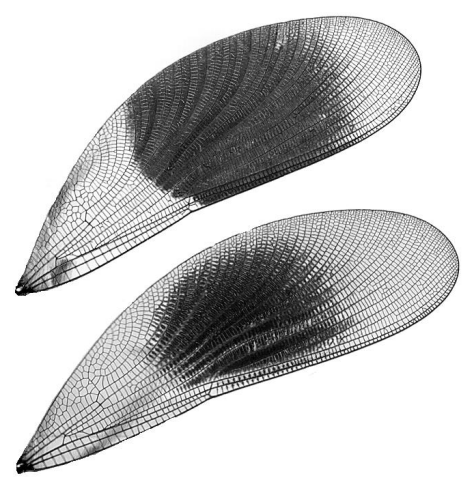 Importance: This was the first demonstration of geographical variation in wingspot size and suggested that ecological (i.e. temperature) processes were influencing wingspot size in addition to evolutionary (i.e. female choice) processes. This is part of a series of short lay summaries that describe the technical publications I have authored. 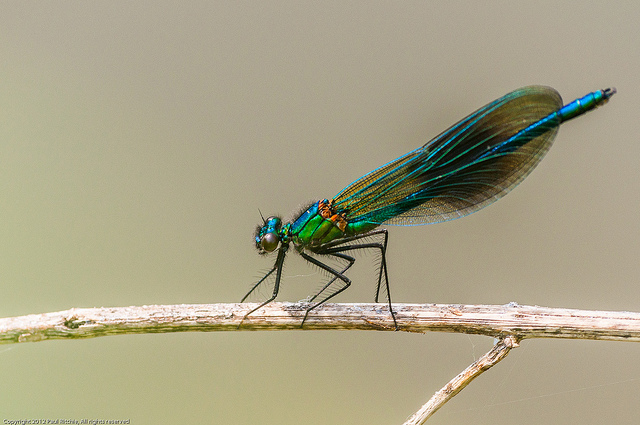 This paper, entitled “Variation in the wingspot size and asymmetry of Banded Demoiselle Calopteryx splendens (Harris, 1792)”, was published in the Journal of the British Dragonfly Society in 2009. You can find this paper on Figshare.